For more Ruby Bridges Resources, click here! 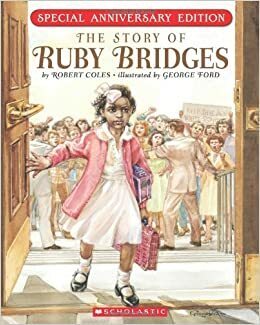 Summary: The story of Ruby Bridges is a well known story about an African American girl, chosen to be one of the first to integrate William Frantz Elementary School in 1960. Each day on her way to school, she was met with angry protesters often yelling threats at her, to the point where she needed to be escorted to school by federal marshals. Each day, she respectfully ignored all of the negative people and their hurtful comments and did her very best in school. Social Justice Element 3- Exploring Issues of Social Injustice: In New Orleans in 1960, racial tension was at an all time high. The process of desegregating schools was a tough one because many parents of white students did not want their children to go to the same schools as African American children. When the students were beginning to be integrated, threats ensued and many white children were taken our of school. With this text, students are able to see that someone around their age was being picked on and threatened by people that do not like her because of her skin color. They are able to see how she was able to cope with the negativity and how her bravery back then is a big reason why they are able to be in the same classroom as some of their best friends who may not have the same skin color as them! Activity: An activity that I believe would go great for this text is first splitting the students up in groups and having each group write a letter to either Ruby Bridges, or a member of the crowd that was angry with Ruby. In this letter, they can ask any questions that they may have the for angry crowd member concerning why they felt as though Ruby should not be going to school with the other children along with any other questions they may have for them. they can also ask Ruby any questions and/or commend her for the way in which she handled herself during these tough times.